"Mommy, what is prayer? "^^A whole new generation of children are stopping dinner conversations all over the world with this thought provoking question. This first video designed especially for pre-school children features Dove award winning artist Steve Green as the host. Created with both entertaining live action and charming animation, Prayer Bear is woven together with original music that every child will be singing. Your child will discover the simplicity of prayer. They will be introduced to the idea that prayer is simple talking to God.^^"Mommy, why do we pray? 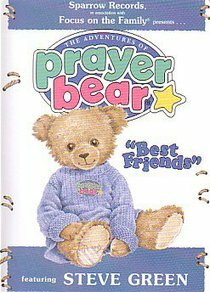 "^^Prayer Bear helps us see that God is there even when we can't see Him; and that God is our friend, and the more we talk to God, the stronger our friendship with Him becomes. Original music by Frank Hernandez (Music Machine, Hide 'Em In Your Heart, Guideposts Junction), and animation by award-winning animator Michael Sporn. Steve Green tells us about Prayer Bear's first adventure with Steven James, who is just beginning to see that prayer can be a part of everyday life for a child. About "Best Friends (#01 in Prayer Bear Visual Series)"